Blood Oxygen Level-Dependent Magnetic Resonance Imaging (BOLD-MRI) has been used to assess myocardial oxygenation but implementation in clinical application has suffered from long scan times and inconsistent image quality. Steady-state free precession (SSFP) based sequences have been shown to have BOLD sensitivity. In addition they tend to have fewer artifacts. To test whether a new SSFP-based sequence is robust and has sufficient diagnostic accuracy for detecting changes in myocardial oxygenation induced by endothelium-dependent and endothelium-independent coronary flow changes in the canine heart. A T2-prepared SSFP sequence with T2- and T2*-sensitivity was developed. Three anesthetized dogs were instrumented with a coronary infusion catheter in the circumflex coronary artery (LCX), an MR compatible epivascular flow probe around the LCX and a catheter in the coronary sinus. Using a clinical 1.5 T MRI system (Avanto, Siemens Medical Solutions, Germany), BOLD-sensitive imaging with the new sequence and additional T2* mapping were performed during LCX intracoronary infusion of adenosine and acetylcholine (ACh). The perfusion territory of the LCX was identified by intracoronary injection of a small Gd-DTPA bolus. Images were analyzed using validated software. Paired T-tests were used to compare results before and after intracoronary infusion. 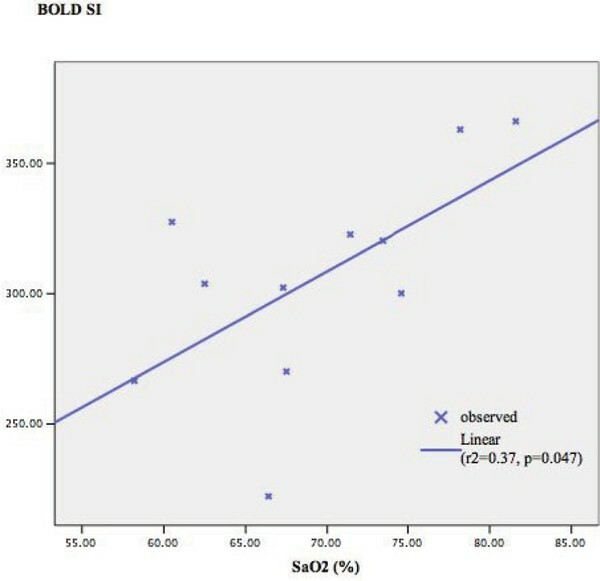 Correlations of BOLD signal intensity and T2* values in the LCX territory with coronary venous oxygen saturation (SaO2) were calculated by linear regression analysis (SPSS13). Good image quality was achieved in all dogs with excellent reproducibility of signal intensity during 20 baseline scans (SD 1.1%). In one dog ACh infusion led to a flow decrease in the LCX most likely representing a paradoxical coronary vasospastic reaction. These data were not included in the calculations for ACh effects but were included in the regression analysis. 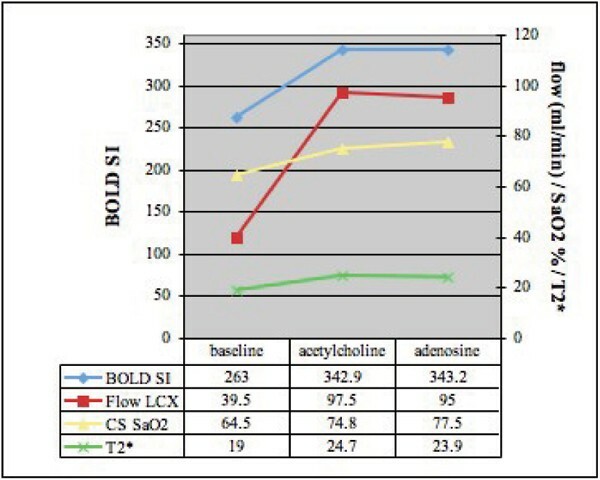 Compared to baseline and rest myocardium, there was a significant signal increase in the LCX territory during infusion of 1.0 microg/min ACh and 0.3 mg/min adenosine (32.3%, CI 18.3% to 46.3%, p < 0.05 and 32.3%, CI 18.3% to 46.3%, p < 0.05 resp.). Both drugs resulted in a similar flow increase in the LCX (141% and 133.4% resp.). Coronary venous SaO2 increased by 10.4% and 13.1% resp. (relative increase 16.3% and 20.6%). Compared to baseline, T2* in the LCX territory increased by 30% and 25.8% resp. (Figure 1). There was a significant correlation between BOLD MRI signal intensity and corresponding coronary venous SaO2 (r2 = 0.37, p = 0.047, Figure 2) as well as T2* values (r2 = 0.30, p = 0.023). SSFP-based BOLD-sensitive MRI allows for imaging of myocardial oxygenation induced by endothelium dependent and independent vasodilation. Signal intensities correlate with coronary venous SaO2 and T2* of the myocardium. Further studies should address its feasibility in clinical settings.